For the uninitiated, molecular gastronomy refers to the combination of classical cooking techniques and simple chemistry to create one-of-a-kind culinary effects. With the techniques (and specialized ingredients), one can make soy sauce foams, exploding cocktails, powdered Nutella, arugula spaghetti, and other curious foods and drinks. The molecular cuisine trend started in Ferran Adrià’s elBulli restaurant in Catalonia, and quickly spread through the world’s top restaurants over the past couple of decades. I realized, shortly after opening Gastromio, that there was a major gap in the molecular gastronomy market. 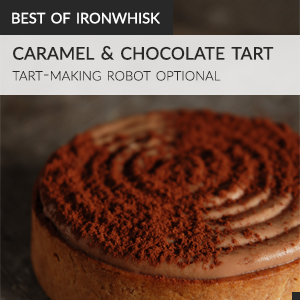 For far too long molecular gastronomy has been difficult, scientific, technical, and exclusive. But really, it’s none of those things. It’s just a new way of cooking, with ingredients that come from sources as natural as flour. It can also be ridiculously easy. And, in ways that classical cooking cannot, molecular gastronomy delivers that wow-factor whether you’re a professional chef or curious home cook. Although interest in Gastromio has been very high, this opportunity is why I’ve decided to shift gears and focus on something brand new. I’m now working on an idea that will really change the way home cooks approach modernist cooking. Big things are happening in the next few months. Molecular gastronomy is finally going to be easy. Approachable. And fun, for everyone. Stay tuned, stay hungry. I hope you’ll join me for the next 100 recipes, too. NB: You can find the project I alluded to above at Atom&Eat, but I’m no longer working on it (2017/05/05). 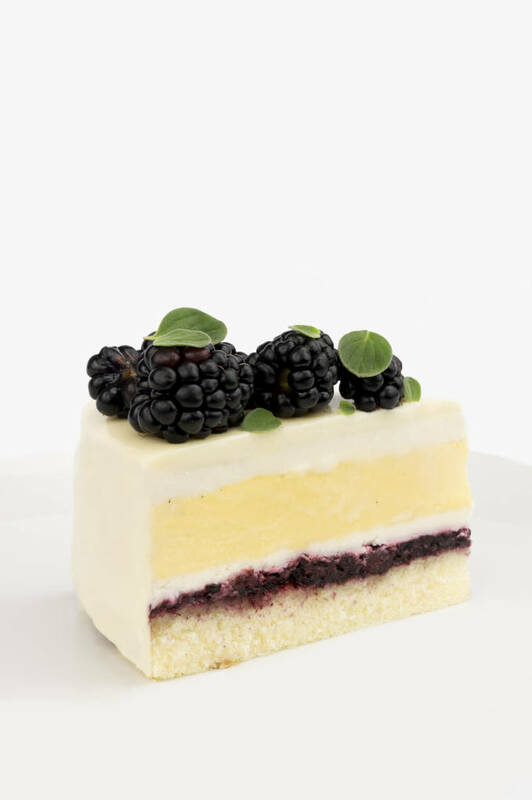 A deliciously moist dessert with blackberry coulis, sponge cake, honey mousse, and saffron crème brûlée. All glazed with white chocolate. Inspired by Nadege Bakery's La Mancha cake. Line a 9’’ round baking pan (or a similarly sized square baking pan) with tinfoil. Be sure to completely cover the bottom and sides of the pan. Then, place the baking pan into a larger pan with high sides. Combine the cream, milk, saffron, and split and scraped vanilla bean in a medium saucepan. Bring to a simmer over medium heat, remove from the range, cover, and let stand undistributed for 15 minutes to infuse. Whip the egg yolks and sugar in a large bowl until combined. Bring the cream mixture to a simmer once more, and slowly pour into the bowl with the egg yolks and sugar while whisking rapidly. Pour the crème brûlée mixture into the tinfoil-lined pan and place in an oven preheated to 300°F (150°C). Pour water into the outer pan with the high sides. This will help regulate the temperature of the crème brûlée in the inner pan while baking. Bake for about 20 minutes, or until the crème brûlée is slightly jiggly when the edge of the pan is tapped. Remove from the oven, cool to room temperature, and transfer (in the tinfoil-lined pan) into the freezer. Whisk together the sugar, cake flour, baking powder, oil, and eggs for 6 minutes on high with a stand mixer. Add the milk and whisk for 2 more minutes at medium speed. Bake in an oven, on a sheet pan lined with parchment paper, preheated to 350°F (180°C) for 10-15 minutes, or until lightly browned. Combine all of the ingredients in a small saucepan and bring to a simmer. Stir occasionally until thickened, and then remove from the heat and let cool. Sprinkle the gelatin over 15g of the cold water in a small bowl and let rest for five minutes. Combine the 60g of cold water with the honey in a small saucepan. Bring to a simmer, and then stir in the gelatin mixture and remove from the heat. Cool to room temperature before using in the mousse and soaking the sponge cake. Whip the cream to soft peaks in a large bowl, and then fold in the honey simple syrup. Cut a layer of sponge cake and also a similarly sized layer of crème brûlée with your mousse/entremet ring (pouring hot water over the ring and wiping it dry before using the ring like a large cookie-cutter will help cut through the semi-frozen crème brûlée). I used an 8’’ round one. Set aside the crème brûlée for a moment, but put the sponge cake in the bottom of the mould. Brush liberally with honey simple syrup, as desired. Add blackberry coulis and spread uniformly over the cake. Add half of the honey mousse, then the saffron crème brûlée, and then the other half of the honey mousse. Freeze until firm. Sprinkle the gelatin over the cold water in a small bowl and let rest for five minutes. Next, bring the whipping cream to a simmer. Stir in the gelatin. Pour the cream-gelatin mixture over the melted white chocolate, in a large bowl. Whisk until smooth. Add the oil and blend with an immersion blender/stick blender. Cool to about 90°F (32°C) for optimal glazing (too hot and the cake will melt, too cold and the glaze won't run smoothly). Remove the entremet from the freezer and pass a flame over the edges of the mousse ring. After the edges of the cake melt slightly, remove the mousse ring. Place the cake on a cooling rack set over a sheet pan. Pour glaze over the edges of the cake and then the center, until completely covered. If necessary, reuse glaze that drips into the sheet pan. Resist the urge to use a spatula to smooth the glaze as it will simply disturb it. Place the cake in the fridge to set and defrost, for about 30 minutes, before slicing and serving. It keeps for a few days in the fridge. Congratulations on your store and your upcoming endevour, it sounds exciting. This cake is beautiful and so complex it must have taken an enormous amount of time to complete. I’ve been busy making Macarons and just remembered you have a tutorial about them so I’m going to look that up now. I love your creations :) . It make me drooling over my iPad right now. I love how the glaze look. I have try to used mirror glaze recipe in the past. But they are all too sweet for my liking. Do you have any recipe for the mirror glaze that not killing the cake with sweetness. Welcome back to blog world. Been missing your posts! What a great one to re-enter the stage! from toronto. you love making sweets. hello, brother!!! I’ve never made entremet cakes before but will definitely try my hand at the hazelnut one once I get a food processor! This one looks fabulous as well. I can’t wait to try out one of your recipes! What do you mean by “oil”? Vegetable oil? Olive oil? Something else?